Recently in the United States, congress has been fighting with the president about food subsidies. The bill for renewing food subsidies also renews the food stamp program, which helps very poor individuals purchase food. Congressional republicans are seeking to make cuts to the food stamp program, denying food stamps to those who are not in part-time employment or in job training. They seek to pass a version of the farm bill that permits state governments to deny food stamps to the unemployed. The president threatens to veto the farm bill if it includes language of this kind, preventing a renewal of the subsidies. There has been no resolution to the dispute as of yet. Today I wish to argue that congressional republicans are attempting to kill the wrong part of the farm bill–they should be targeting the farm subsidies rather than food stamps for the unemployed. To the extent to which the unemployment rate has come down, it has come down because many unemployed people have shifted into long-term unemployment due to chronic inability to find work. The long-term unemployed are not picked up in the unemployment figures, but they do figure into the employment/population ratio, making it a somewhat more accurate employment picture. This additional unemployment must be either cyclical or structural. Personally, I believe the unemployment is cyclical, and much research done in the last year increasingly supports that conclusion. But even if the unemployment is structural, one important fact remains true–unemployed individuals are not responsible for unemployment that is either cyclical or structural in nature. They do not have jobs because they cannot get them, not due to laziness. The Republican Party proposes to penalize people for economic conditions that have nothing to do with them personally. This does not create an effective incentive to work harder to to try harder to find work–the jobs quite literally do not exist–it only serves to inflict unnecessary harm on the poor, the disadvantaged, and the unlucky. It’s immoral policy. Now, on to food subsidies. Here’s where that provocative title comes in–food subsidies in the United States (and in Europe via the Common Agricultural Policy) are stealing from domestic consumers and killing African babies. How? First, the “stealing from domestic consumers” part. One of the critical ways in which farm subsidies operate is by setting a price floor–they prevent the domestic prices of various crops from falling below preset levels. This means that when farmers do produce enough food to drive the price of food down and make it less expensive for consumers, the food bill kicks in and prevents those prices from falling. In the new legislation that congressional republicans are proposing, food prices will be pegged to their historic highs. In order to prevent food prices from falling, the government has to pay landowners not to farm so as to prevent “oversupply”. This means that tax dollars are being used to prevent too much food from being produced, so as to prevent food prices from being too low. This costs those of us who buy food more money that we could otherwise be spending on other things, and, since our tax money is used to sustain this program, we are essentially paying farmers to charge us more for food. This is inefficient madness. I’ve always been one to stand up for government intervention in the economy when it prevents harms or secures benefits, but in this case, we would be much better off leaving food prices to the market. It may result in the occasional failure of small farms, but small-scale farming is vulnerable to failure in no small part because it’s inefficient. Family farms fail because they’re not as efficient and lack the size to sustain occasional misfortunes. Ideally, we expend the smallest portion of the labor force possible in farming, automating as much of it as we can, and use former farmers to do other kinds of work. What about “killing African babies”? Well, farmers use food subsidies not only to secure high prices in the domestic market, but to enable them to use their surplus income from domestic sales to undercut local farmers in developing countries. That’s right–thanks to farm subsidies, it is cheaper to buy food shipped to Africa from Europe or the United States than it is to grow it in poor countries. The result of this is that farmers in poor countries cannot compete with their European or American counterparts on price. As a result, they are put out of business. There is a vast amount of arable land in the developing world that is not being farmed because poor people cannot make a living farming it, and the principle reason this is so is food subsidies. Too often, we hear careless commentators in developed world blame food security problems in poor countries on “overpopulation”. The real problem is one of agricultural and technological development in poor countries, and it’s perpetuated by our farm subsidies and those used in Europe. African babies die as a result of this, not merely because they starve (although some of them do) but because the reduced rate at which their countries develop reduces their access to medical care. The perpetuation of poverty in the developing world also harms the life chances of those unfortunate enough to be born in such places in a myriad of other ways (education, job opportunities, quality of life, access to technology, plumbing, clean water, the list goes on). I would not expect any change in policy–the biggest victims of farm subsidies are poor people living in poor countries about which European and American politicians have no reason to care. That said, domestic consumers in the US and Europe suffer as well from the artificial inflation of food prices, which outpaces the wider inflation rate. It’s a pity that citizens in the developed world are not conscious enough of the fact that farmers regularly leech off of them with the help of their duly elected republican congressmen to do much of anything about it. Now wait a second, Balance of Payments combined with the logic you employ here means your generic African is making out pretty well. Every dollar that goes abroad must come back in another form. That is, everything must be paid for. Say we export 100 dollars worth of corn to South Africa. Some South African has to buy 100 dollars with (for ease of argument) 1000 Rands. That means some American now has 1000 Rands. The South African then buys the corn, sending the American 100 back domestic. The American then imports 1000 Rand in goods that are presumably not corn. (The Rands likely change hands after the initial exchange, but I’m keeping things simple.) This is true /regardless/ of whether or not corn prices are subsidized. Let’s take this maxim as true: “Ideally, we expend the smallest portion of the labor force possible in farming, automating as much of it as we can, and use former farmers to do other kinds of work.” Provided the exchange is not effective corn for another crop (which is likely to be true at least some of the time), this kind of trade would be good for Africans who could decrease the amount of farm labor. Much more critical to your point is this one: “[S]mall-scale farming is vulnerable to failure in no small part because it’s inefficient. Family farms fail because they’re not as efficient and lack the size to sustain occasional misfortunes.” One way in which efficiency is increased is by consolidating farms to more compact areas. This is true transnationally. The only people who lose out are small farmers short term, who become frictionally unemployed until they seek the proverbial 1000 Rand in another industry, and the Americans subsidizing this whole affair. Your argument would be a good critique of mine if it were true that Africans who didn’t farm performed other valuable work instead. Generally speaking, they do not–unemployment rates are very high in African countries. A further issue is the fact that it may be socially utile for additional food to be produced even when producing said food is not financially profitable because food is a necessity and not a luxury item–driving down food prices is a good in itself. If African farmers could farm at an efficiency that rivaled US/EU farmers, the world as a whole could produce more food, reducing global food prices. That level of sophisticated farming technology is not available in no small part because people do not farm in developing countries with food security issues in the first place. It may be the case that the market will not produce conditions such that farmers can produce the optimal amount of food without going out of business, and it may be necessary to subsidize farmers in some way as a result, but not in such a way that poor consumers pay an increased price, but in such a way that affluent taxpayers pick up the tab. I’m not arguing in favor of the policy, which I agree is a net detriment. I’m stating that you have relied on a common economic fallacy (one that contradicts your Keynesian principles, no less!) in trying to show harm in African economies. The question is not if unemployment rates are high, but before I make that case I want to say a few words about “high unemployment” in African nations. Like all economies, African countries face the Phillips trade-off. Developing nations as a general rule do not have a terribly favorable Phillips Curve; economic problems necessitate high interest rates which in turn breeds inflation expectations. This is the economic reason for high unemployment in these nations; lower unemployment comes with prohibitive inflation. Regardless, the question is one of /marginal/ employment. What happens when farmers are forced to do something else? In general, contrary to popular conceptions, they are able to find other work or raise specialty crops the developed world does not have a comparative advantage at raising. Since they are paying less for food and still working, this is a general boon for citizens of these nations. If we are painting with broad strokes (which is problematic in its own right), Africa’s problem is one of inflation, not subsidies. I doubt the effect is large in practice, but this deflationary effect is likely good for the Phillips Curve. It simply doesn’t follow nations trading at lower prices are worse off; if that were true, the balance of payments couldn’t balance. Nations trading at lower prices are better off in the short term, but worse off in the long term when trading at lower prices prevents efficiency improvements in production. Subsidies prevent African countries from developing high-efficiency agricultural sectors, so of course agriculture in Africa remains less efficient than agriculture in the US/EU. That’s what we’re trying to change in the long-term. I would like to see data that indicates that failed African farmers go on to prosper equally in other forms of employment, if such data exists. I’m fully aware that under free trade, food prices in Africa would be as low as they could be in the short term. But free trade can prevent newer, potentially more efficient future industries from getting off the ground, particularly when it’s combined with distorting subsidies that mess with inherent competitive advantages. If food security is a problem in the developing world, we need policies that increase food output and lower food prices. Getting rid of subsidies increases food prices in the short run, but decreases them in the long run by forcing domestic farms in the developing world to get more efficient. This is actually reversing what the strong and weak points of my argument are. In the long run, the hypothetical 1000 Rand in demand would end up back in some South African firm(s). Some of the profit would be reinvested into capital in the industries in question, allowing them to develop. Structural shortages are logically impossible in the long run—the long run is the time it takes to address structural deficiencies. In the /short run/ there are two problems with my argument that I fully acknowledge. First, structural unemployment is a possibility until capital moves, and this could take time. Second, it will only move once that 1000 Rand is repatriated; so long as the currency in question is held in foreign reserve, the nation gets no benefit. In practice, however, capital acquisition happens slower than in the developed world, but not damningly so. Further, currencies of developed nations are rarely held in reserve for long; you want a more credible currency for reserve. The more pressing problem is that capital acquisition is difficult and especially costly in most African nations. (Indeed, the degree of difficulty is an important indicator of economic success.) This is true the farming sector and all other sectors and better accounts for the Phillips relationship than imports. There’s a lot written on the vibrancy of the African middle class and, as with most empirical questions, you can find a lot of evidence both ways. But after spending some time with the literature, the idea of the African farmer is something of a myth. Most African farmers have to be many things because of poor crop yields be many things. That’s not just a tech or capital problem; the United States is likely exacerbating, not creating, a comparative advantage because our heartland is so fertile. Freeing up Africans to work on other things on American tax money can only be good for those Africans. It’s possible that it doesn’t help those farmers 1-to-1, but that objection neglects many of the unemployed people who must be hired when the money is repatriated as well as /everyone/ in the nation benefiting from reduced food prices. In this context, “long-run” means “after the African economies have adjusted to the absence of farm subsidies in the developed world” and “short-run” means “the period in which this adjustment has not yet taken place”. Your argument seems to presume the absence of a food security problem in Africa–this is a part of the world in which many people are malnourished and in which some number of people do die of starvation. American and European farmers and states do not have an adequately high level of concern for the plight of poor Africans and so do not adjust production as needed, because it is not profitable to eliminate the food security problem in Africa. African states have a direct stake and so will better manage production to suit the needs of their citizens. The challenge is bringing African agriculture up to speed efficiency-wise. Yes, the United States and Europe have distinct comparative advantages with many crops (exacerbated or perhaps created by subsidies), but with modern farming technology there is no reason why African states can’t compete with more tropical crops (African rice, perhaps?). Part of the very reason Africa has trouble maintaining high levels of investment is that its vast mineral wealth is constantly exiting the continent in order to pay for food. In sum, I’m making an appeal to New Trade Theory here, arguing that by aiding African agriculture now, we can generate a sustainable, dominant industry going forward that otherwise will not come into existence. Africa doesn’t have any financial stability at all. Ergo, it does not have capital accumulating. Agricultural development would benefit Africa because it will increase organic societal infrastructure in regions that has limited infrastructures. It really doesn’t matter, though, because Big Ag can outspend the African continent in lobbying the U.S. government. This is precisely why I don’t think the fledgeling industry argument applies here; there’s nothing in the nest. So, I found the relevant data for a straight-forward analysis. (http://ageconsearch.umn.edu/bitstream/59870/2/TB19251.pdf) So, it turns out, the cross-elasticity between food and non-food in most sub-Saharan nations is close to zero. A change in the price of food has next to no impact on other sectors. This implies that goods are not being exported. It is possible that there is some kind of substitution happening within agriculture. In an essential way, we may be trading (say) corn for coffee. In this way, farmers wouldn’t even be harmed, at least not after a season or two. More likely given what we know about national finances in sub-Saharan Africa, the difference is being made up in the financial account—that is, outstanding debt. So, I would say food subsidies are hurting African farmers with this qualification: if not food, something else would be imported and harm African workers with no countervailing exports to improve the situation. Finally, this means that /total/ welfare does increase under this regime. Lower food prices means that there is more food in the nation, and this undoubtably helps poor workers in other sectors in a very real way. So, I think we both missed the ball here. Food subsidies do harm poor Africans, though note the foregoing qualification about total welfare. However, there is still a net increase in welfare. Further, African debt is the origin of the lost welfare; it is the American subsidy that “aims” it at African farmers. I’d say that’s fair. There is one thing that I think isn’t quite addressed here though–since subsidies make it difficult for African farmers to compete, is it not possible that, by preventing African farmers from doing any farming at all, they decrease total food production? Say we have Farmer A (American) and Farmer B (African). Under the subsidy model, A produces X amount of food at price Y. B cannot produce any food at price Y, so B doesn’t farm at all. If we got rid of subsidies, A would produce X amount of food at price Y+Z. If it were possible for B to produce food at price Y+Z, B would be a viable farmer. If A produces the same amount of food with the price hike purely the product of the absence of the subsidy (which seems likely, because the farm subsidies program is aimed primarily at capping supply so as to hold up domestic prices–without it, domestic supply would, if anything, increase) and B produces more food than before, wouldn’t that lead to an increase in total food production that might drive the price lower than it was originally, but by increased supply, without the subsidy bias in favor of American/European farmers? In which case, couldn’t removing the subsidies aid African food security? Not under normal economic assumptions. You’d have to violate downward-sloping demand to get that result. Undercutting the domestic farmers allows foreign producers to produce farther “down” (and therefore to the right) on the demand curve. Food consumption would actually /increase/ under such a regime. 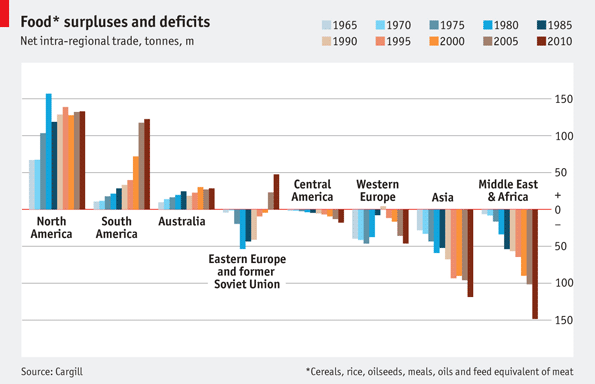 So, from that perspective, you’d expect food security to increase. Immediately when you remove the subsidies, sure, higher prices would reduce consumption. But if removing the subsidies causes African farmers to increase supply without reducing production in the US/EU (or even potentially leading to an increase in production in those places), wouldn’t the total supply increase resulting in lower prices down the line? So, in closed-economy equilibrium, farmers produce X. When the price falls (in this case, due to a foreign subsidy and more product entering market), any farmer producing with marginal costs above the original price will stop. We’ll call that difference Y. So, domestic production is (X-Y). This roughly accounts for the loss of domestic welfare, though some niceties apply. Because the price is lower, equilibrium on the demand curve must have a higher quantity than closed-economy equilibrium. That is, the imports must cover Y and then an additional amount Z. The new equilibrium quantity is (X-Y+Y+Z=X+Z). This is clearly greater than the original. Oh, and yeah, production might well increase in the United States, but the price would have to decrease below the subsidy price (and not the pegged price!) for Africans to benefit from that. I won’t rule it out, but it would imply fairly dramatic elasticities of supply in the United States that I’m skeptical of. Regardless, American welfare would increase and thus I do support the repeal. I just don’t see how Africans would experience a net benefit. It’s all academic, since we agree on the policy here. It’s important to note where precisely the supplied demand needs to be to adequately manage African hunger problems. If the increase in African supply with a decrease in foreign imports isn’t enough to meet that minimum sufficiency level, might African states be compelled to do something to increase production to meet that level, something that the US/EU don’t presently feel sufficient political pressure to do, because their farmers benefit from keeping supply down? What if African countries started subsidizing their own domestic production so as to encourage additional production (as opposed to the way US/EU subsidies work, where additional production is discouraged) so as to shift the domestic supply curve to the right? Wouldn’t that increase total supply? It seems that on some level the food security problem is an issue of profitability. We have the capacity to make enough food so that no one is hungry, but doing so reduces the price such that it’s not profitable to do. Well, there are three considerations here that make this prohibitive, though we could theoretically take drastic steps to implement a domestic subsidy that would increase domestic food production. First of all, in order to increase food production we’d have to “clear” the (X+Z) level of food production; the subsidy would have to lower the price below the West’s marginal cost of production. Failure to do so would not increase production, though it would increase producer’s welfare with no loss to consumer’s welfare. The harmed party here is the American farmer. Above (X+Z) production would increase. You would need an enormous subsidy (one greater than the subsidy that allowed for Z in the first place) to overcome that. There’s a further problem that in welfare analysis, production above equilibrium requires the government to pay more to foot the bill in subsidy than the welfare returns. (http://www.sjsu.edu/faculty/watkins/taximpact.htm.) We could make an /equity/ argument for this on the basis of food, but in the context of the general equilibrium analysis that is to follow, I am not swayed. Finally, there’s the issue that this subsidy has to come from somewhere. First off, you have to raise a tax on other sectors. This has a measurable deadweight. Further, by the study I provided earlier, each percent increase in the price of non-food lowers the consumption of food by about a quarter of a percent; that’s a pretty significant welfare burden if we’re talking about people who are already facing food insecurity. We could instead have African governments take on more debt, but again, that necessitates a debit in the Current Account and is very much like feeding the dog it’s own tail. Point being, there is quite literally no free lunch here. Welp, we can figure that out. An elasticity at zero means you find a change in GDP unacceptable regardless of the starvation it incurs. Between 0 and 1 implies that you prefer GDP. 1 implies indifference. Greater than 1 implies a preference for food. Infinity implies you will do whatever it takes to reach food security, damn the impact on the wider economy. Since elasticity is non-linear (log-linear, actually), I would recommend testing your choice. For example, 2 would imply: I would accept no more than a 2% decrease in GDP for a 1% increase in output. (-2 x 1%=-2%). Once you post that, I’ll tell you how much of the food shortage you can cover with that constraint and the economic cost. I recognize this is a thought experiment and that pigeon-holing you into a single number without diminishing returns is more than a little unfair. But it does give us a calculable point to work from in discussion before you provide nuance. Hmm, this is really just throwing a figure out there to help us out, but let’s try 0.5 so that for every 1% increase in food supply, we accept a 0.5% decrease in GDP. So if Africa needs 8% more food, we’re willing to accept a 4% reduction in total GDP for the moment to get there. See what we can do with a fairly tight constraint. Okay, so the model actually throws two equilibria, which is really interesting in its own right. Basically, we can choose to tax non-food to subsidize food or vice-versa. Both policies actually fall below your elasticity bound. Taxing food is technically better based on the criterion of the elasticity of demand for food with respect to GDP, but the deflation rate makes it unfeasible. So, we could tax non-food. I see why this is unappealing to the African elite. An additional 4% inflation is tough on banks. They lose a tenth of the non-food goods and services in the nation and trigger a recession. Given that 3% of GDP is lost, I wouldn’t bet that all the gained actually reaches the poorest people. Closing food security is certainly in reach of Africa’s elite, but they would have to pretty dramatically drop other things to get there. Thanks for running those numbers, Rick. Fascinating conclusion–it seems reasonable to say that even in the absence of US/EU food subsidies, African power-brokers would still have a class interest in maintaining current starvation levels. Nice to know that we are far from the only thing standing in the way here.